Mostly, the laundry room is the corner in the house where nobody wants to go. But unfortunately, doing laundry is a necessity of life. We have a very small laundry room and I don’t mind doing laundry at all, but I do mind the way it looks right now. 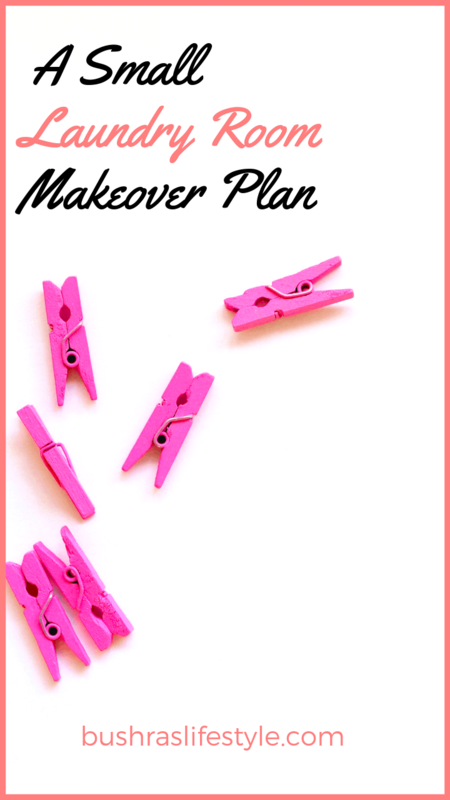 Therefore, stick with me while I am going to show you my laundry room makeover. 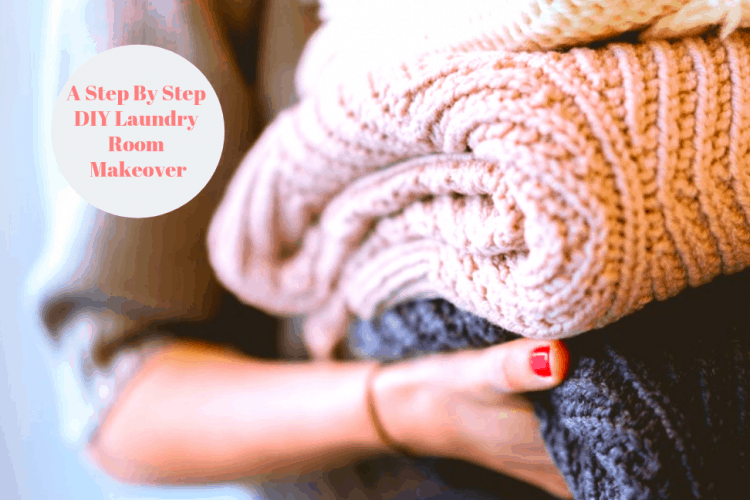 You would learn the process to turn a boring space into a lively little corner to wash your dirty clothing. Here is how exactly our it looks like right now. A fairly small room that is in need of a good facelift. 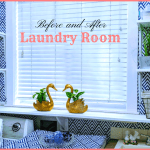 Sometimes laundry room makeovers can be as simple as a new hamper or as elaborate as tearing down a huge wall. However, our case is in the middle. We are neither tearing down any walls or buying a hamper. 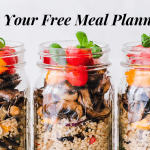 Therefore, I decided to put a plan together to give it a new look on a limited budget. Pretty boring, right? When we enter the house via the garage, the first thing we see is this boring room. It has very limited space. I know in the picture above it looks very dark and boring. But, on the other hand, I can see potential in it. The only thing that’s limiting me is our budget, as we are not going to change the washer or dryer. We will buy a new washer and dryer for the new laundry room that we are going to build in our garage in the future. For now, I have to tackle this project somehow. The previous homeowner added a storage cabinet only on one side, though. 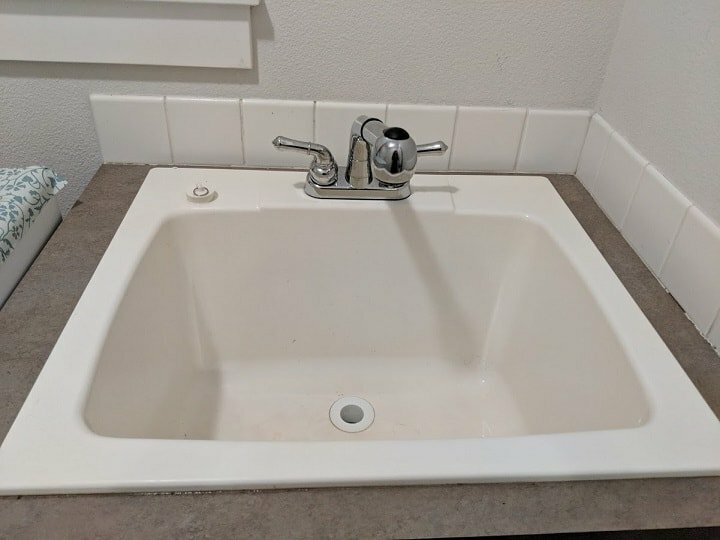 The part of the wall above the sink looks really empty and uneven. 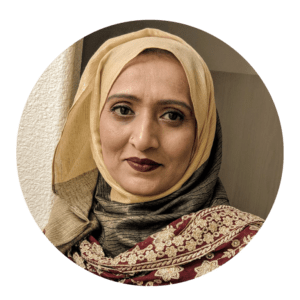 Bushra’s Lifestyle is a participant in the Amazone Services LLC Associates Program, an affiliate advertising program designed to provide a means for us to earn fees by linking to Amazon.com and affiliated sites. So the very first thing we did was to take that lonely and way too boring cabinet down. It just was a so uneven and unpleasant looking thing hanging up there in the corner. While talking about designing, let me tell you a really good rule of thumb to stick with: Symmetry is very important when you are working with any design unless it is abstract where people use the free designing method. I have a little OCD, so I’d rather follow symmetrical designing rules. It’s like Algebra, whatever is on the one side of the equal sign it has to be on the other side as well. See how systematic designing rules are? It was just a side note for you guys! When you pay attention to details, you really see phenomenal results for your projects. Symmetry also appeals to the eyes. 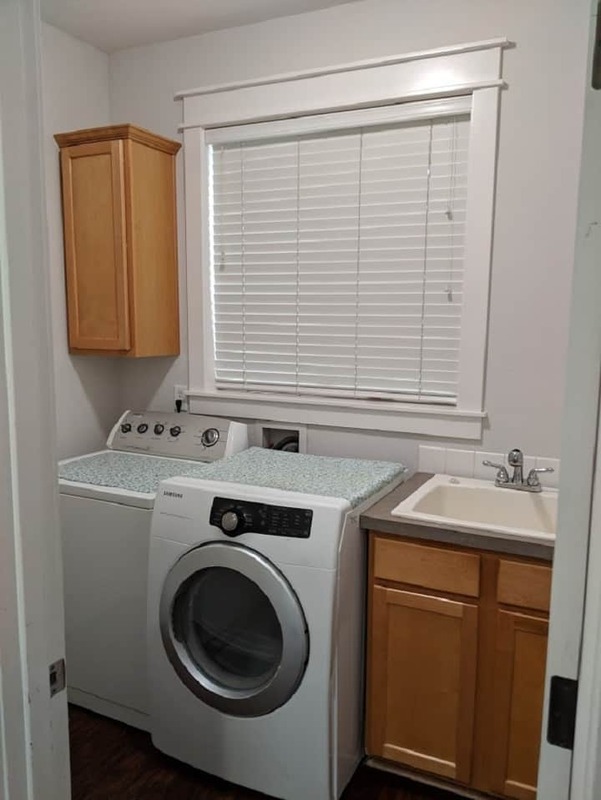 Our laundry room is very narrow, and not much to work with if you look at it. Yet, I am excited to turn that little boring corner to a pleasant and welcoming place to do laundry. I already told you guys that I am a weirdo who likes to do laundry. Don’t get me wrong, I do get tired as well but on the other hand, as my mother always says “You are a born responsible girl”, so I just want to knock it off my to-do list as soon as possible. Well, here is a story for you guys, once my husband decided to help me and he did the laundry. Guess what? A lot of my scrubs were shrunken after that, and many of his shirts were not in good shape either. I was not sure If I should say “thank you” or cry over my scrubs. However, I just said “thank you” and gave him credit for at least trying to help. 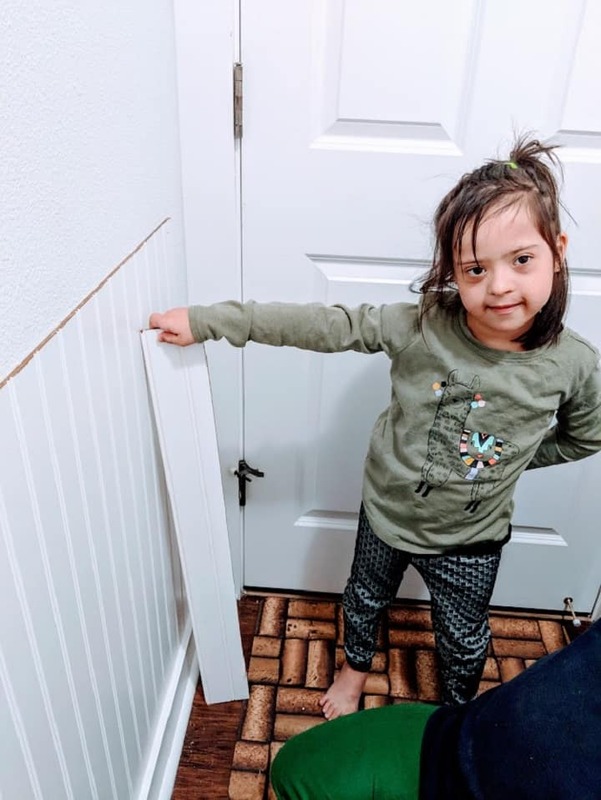 The second thing we decided to do was put wainscoting for ⅔ of the wall. 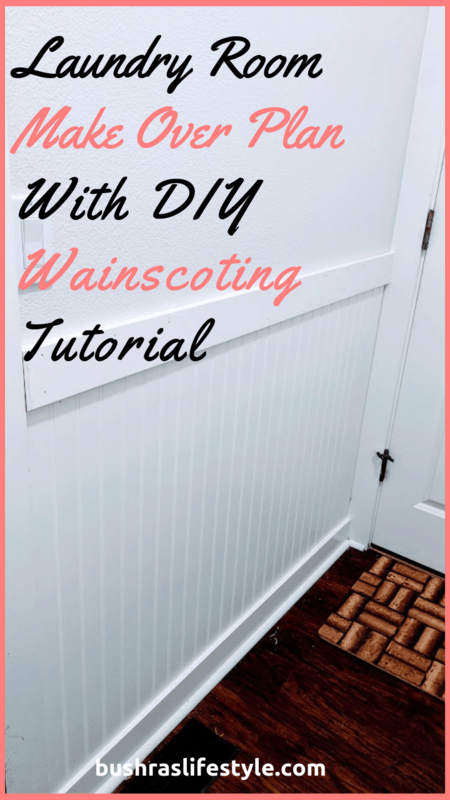 I can’t tell you how big of a difference this simple and elegant do it yourself wainscotting made! Here is a quick tutorial for you. 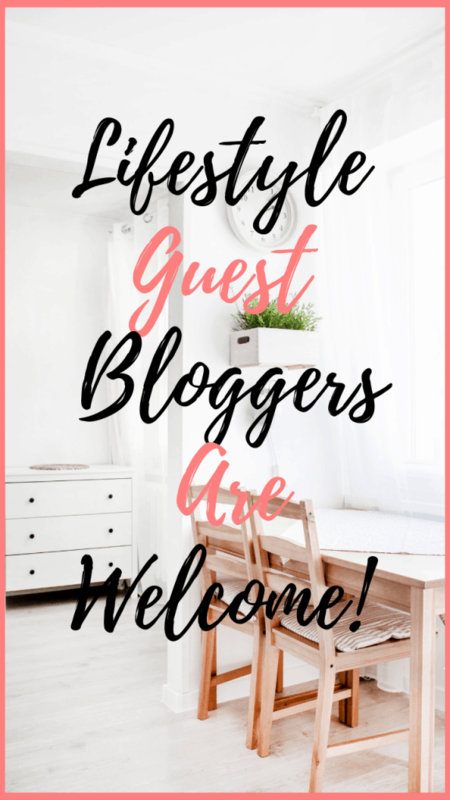 I meant to do this DIY wainscotting in a separate tutorial, but it was very easy, so decided to keep it within this makeover! 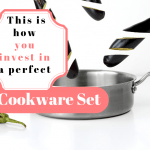 Now, let me show you how my husband rocked this very simple tutorial under an hour. This simple DIY wainscotting treatment can change the look for your laundry room or any room in the house. 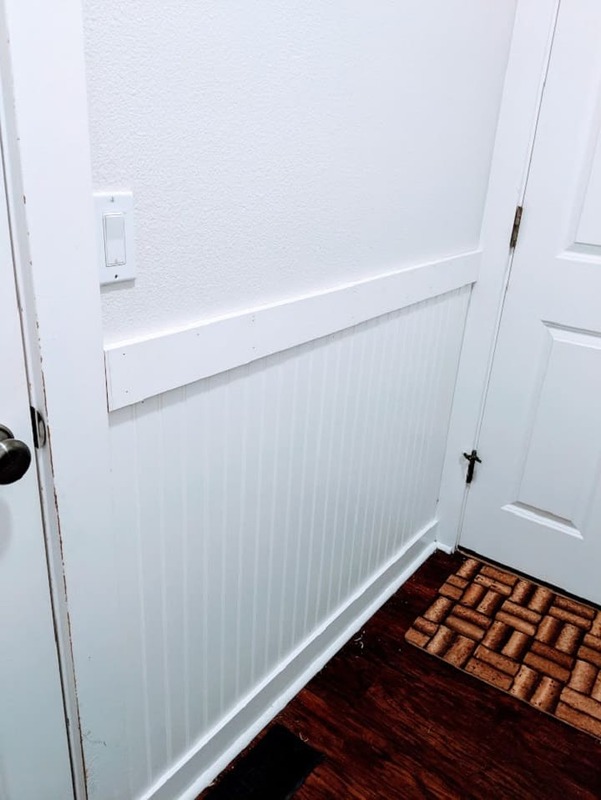 I wanted to go with a DIY board and batten wainscoting, but then I thought of this being a very high traffic area as our garage door opens up to the laundry room. 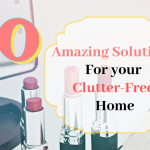 Hence, we decided to go for something more durable and easy to clean. Honestly, this is the easiest step. The skill level for this is not high. 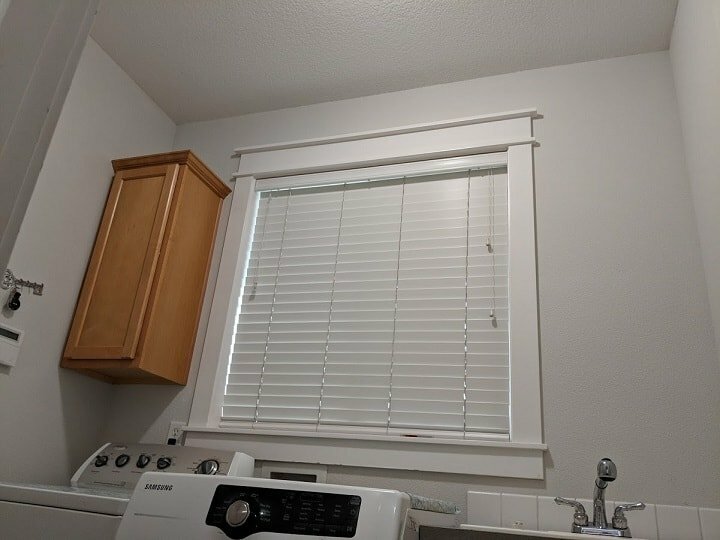 The reason I said that is because we purchased the pre-made wainscotting, but you do the required skills to use the tools for a custom-made cut. The general rule of thumb people use for low wainscotting is ⅓ of the wall height. However, for this DIY we used the full height of the store-made wainscotting. 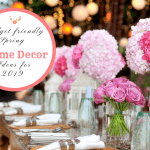 Firstly, just clean your wall, because as with these types of DIY wainscotting, in your laundry room or any other room, you don’t need to paint before installation, as it would cover your wall. You paint it after. Just clean it well with a cloth. Make sure you fill any holes you have on the walls. Secondly, you would remove your baseboard to match with your top board on your wainscotting. We didn’t have to remove it, as we are using the same MDF board on the top as well. If you are planning to paint the rest of the room above the wainscotting, do it before. I changed my mind and I am going to wallpaper so I don’t have to paint it. All I am going to do is fill the holes wherever needed. We are also going to paint the ceiling before we put crown molding on the ceiling. Boy, this laundry room is really going to look pretty! We kept the existing baseboards, as they are in pretty good shape. 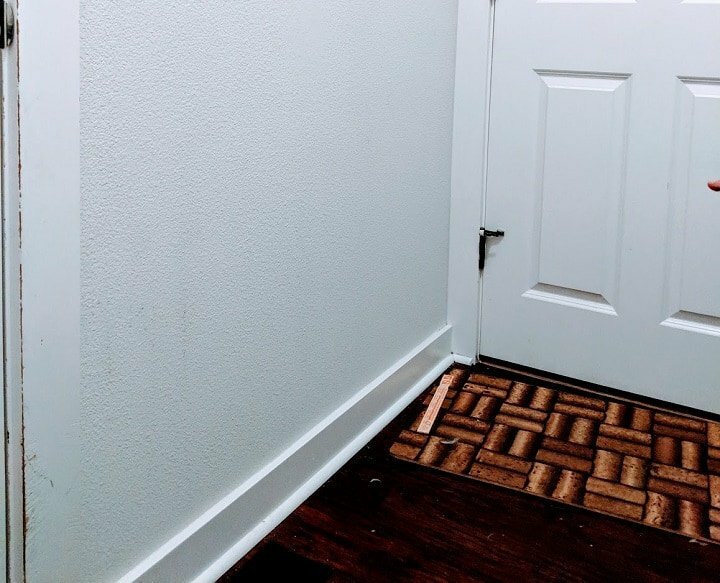 Place the pre-made board right above the baseboard. Once you caulk and paint it, any imperfections will go away. 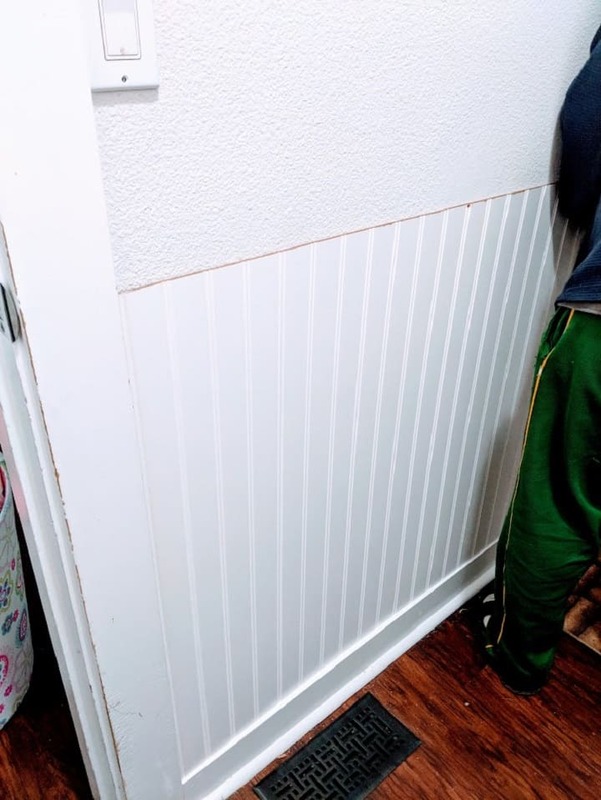 We have used this same DIY wainscoting in our old home and it’s very user-friendly with little kids. For small areas, it’s cost effective as well. 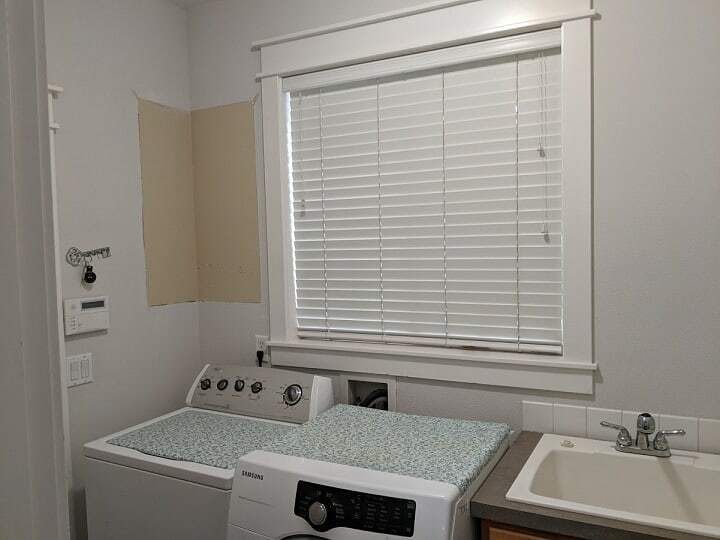 We covered all three walls of the laundry room under $50. It’s also super easy to clean. After placing your board, simply start brad nailing it. Don’t go crazy with nails. Simply place your board on the baseboard! 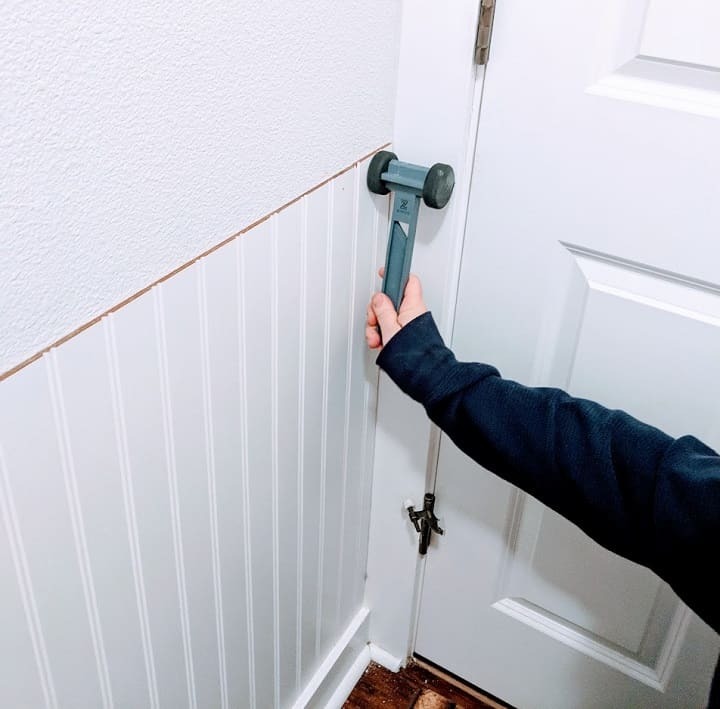 Use a rubber mallet to adjust any part of the wainscotting if it’s a tight fit. Once you are done with the whole wall, then you are ready for the last step of installation. To cut an additional piece, my husband used a circular saw, as we don’t have a table saw yet. 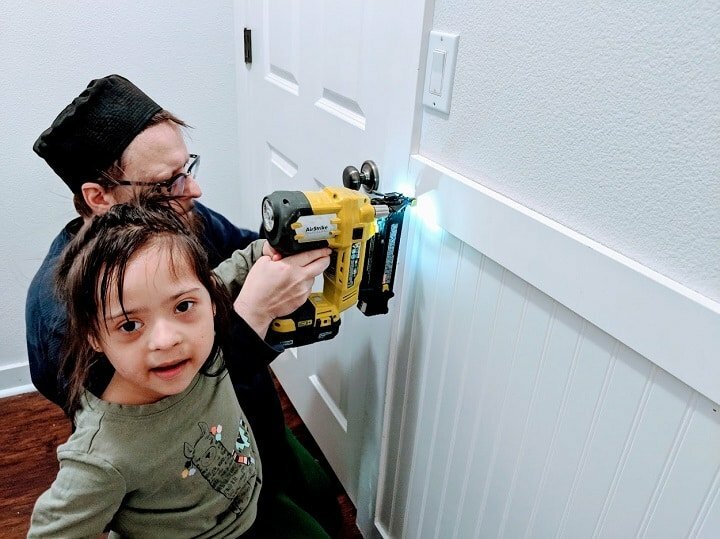 The last thing to do is, put your top board above the wainscoting, start brad nailing, and Voila! You are all done. It’s really worth it, and the big thing is this project is absolutely not labor intensive. However, you do spend a bit of time preparing and cutting the board to the desired length. 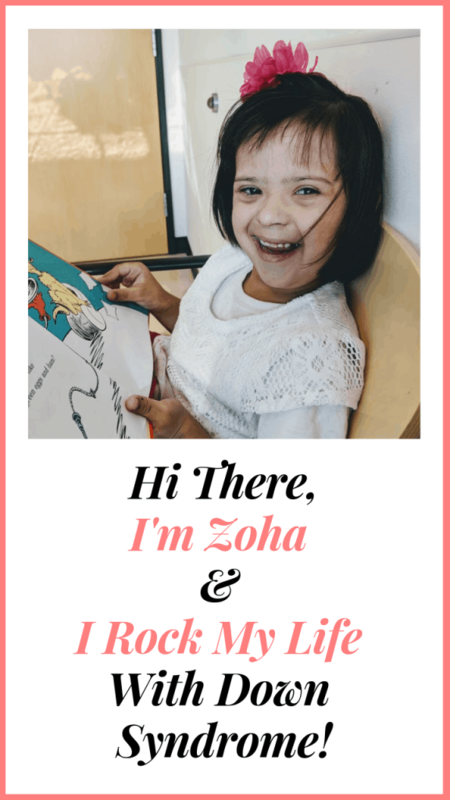 Our little helper is super helpful…LOL! Here is how it looks right now. I still have to paint it. 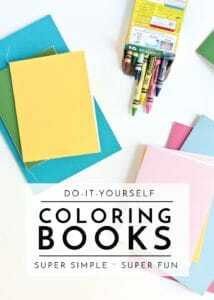 Stay tuned, as I am working on it and will show you the progress on it next week!! !